The Microsoft conference announced several new things about their controllers. New controllers will be equipped with Bluetooth technology for increased range and a textured grip on the inside of the controllers for better stability. We previously saw a diamond textured grip on some of the custom controllers, but now that seems to be standard going forward. Another reveal was the first themed Elite Controller. 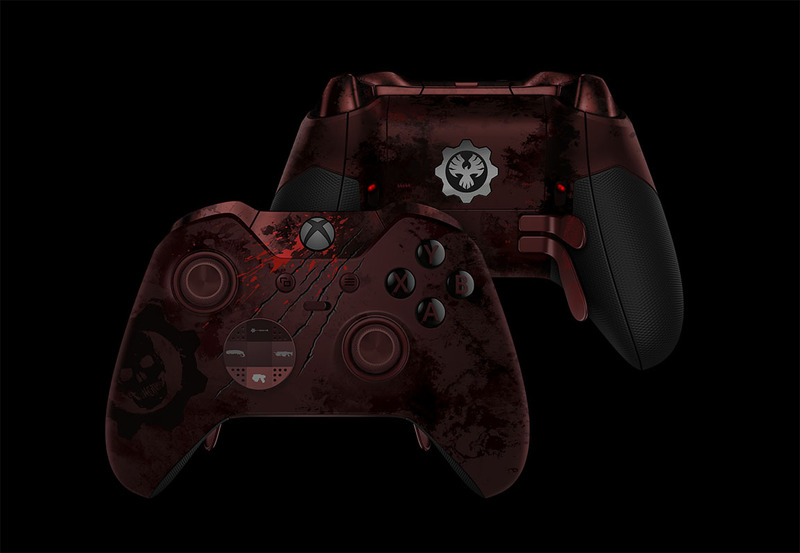 Gears of War 4 will get a very limited edition Elite controller with a rare dark colored Xbox home button, laser etched scratches and all the things you would expect a Gears design would feature. Even the triggers and paddles have blood stained fingerprints, which are Rod Fergusson’s real fingerprints. You can pre-order yours right now for $199.99. This is a limited run so pre-orders may sell out. You can see the reveal video below. And the final bit of controller news is an interesting new concept. If you’ve been wanting a controller in something other than black, but don’t want to settle for a limited edition that isn’t just right then this may interest you. Microsoft is opening the Design Lab which will let you choose from a set of colors to fully customize everything from sticks to bumpers to buttons. You can make the ugliest controller ever created or your own personal masterpiece. Doing this will cost a base price of $79.99 with the option to have your gamertag engraved on the front for an extra $10. Additional charges may be added for some options, though. Click the link above to get started and watch the trailer below to see some of the options available. Two new controllers will be available starting February 7th. The Ocean Shadow (matte black to blue) and Winter Forces (white camouflage) have all the latest features of a textured grip, more range and Bluetooth connectivity for PC support. Both controllers will be be available at select retailers for $69.99. A new series of controllers will be coming out next month. In developing this new controller series, the Xbox team was inspired by military technology and performance patterns, exploring concepts stemming from combat armor and sci-fi mechanical gear. The above controller is called the Recon Tech Special Edition and will be available for $69.99 starting on April 25th. It's the same as the previous set of controllers with textured grips and all the latest changes. The Xbox Design Lab has expanded with even more options to choose from! There are now a few metallic options for triggers and the D-pad with even more new colors for the thumbsticks. Textured grips has also been added as a new option for those that want it. It is also expanding to offer the service to the UK, Germany and France starting today! I believe Canada already had the option, but just in case you guys have access too. More European countries are promised to be added later this year before the launch of the Xbox One X. Three new controllers coming out very soon. First is the new Green/Grey standard controller with bright green accents under the thumbsticks. It will start shipping from the Microsoft Store on August 3rd for $64.99. The new Volcano Shadow Special Edition. The Xbox Wireless Controller – Volcano Shadow Special Edition is the newest of the Shadow series we introduced last year. This controller features a matte black top case and sides that fade to a fiery red metallic finish. The buttons, triggers and D-pad have a glossy black finish with red highlights on the ABXY and menu buttons. This will also begin shipping on August 3rd for $69.99. And finally the Patrol Tech Special Edition. The Xbox Wireless Controller – Patrol Tech Special Edition is the second controller in our Tech series and is inspired by military technology and performance patterns found in airborne navy patrol units. Premium finishes like a laser etched texture, silver accents and insignia are on the front of the controller. The back of the controller features our fan-favorite rubberized diamond grip for added control and comfort. If you want this one you'll have to wait a little longer. It begins shipping on September 5th for $69.99. It will also be bundled with a cable to work on your Windows 10 computer at select retailers. And finally, the Windows 10 Wireless adapter has been improved. The new and improved Xbox Wireless Adapter for Windows 10 enhances your controller connection when gaming on Windows 10 PCs and tablets. It’s 66 percent smaller than the original Xbox Wireless Adapter for a smaller form factor and to fit better next to other USB devices you may have plugged in nearby. The Adapter offers wireless stereo sound support and the ability to connect up to eight controllers at once. It will start being available some time this month for $24.99 or bundled with a controller for $79.99. Thanks to Major Nelson for all the details.